Born in Maryland in 1954, I arrived just in time for the Space Race. I watched the whole affair unfold and surely, it was created just for me. 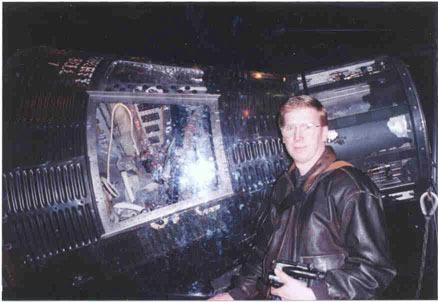 My earliest memory of manned space flight was the recovery operations of one of the Mercury missions. As I watched the TV, I remember asking my mom what that 'thing' was bobbing in the ocean. Of course, watching Gemini and Apollo missions on TV was fascinating, but I also enjoyed building and launching my own rockets. By then, model rocketry had become a pretty safe endeavor, and it provided an outlet for my affinity for knobs, switches, buttons, gauges, wires, batteries, and lights; I constructed launch pads and control panels far beyond the basic requirements. I swear I could have landed a job as set builder for Star Trek. Later, from the banks of the Indian River I watched in disbelief as Apollo 17 turned night into day. I made an audio recording of it --no camcorders back then-- and someone's radio was playing in the background....the announcer covering the launch becoming hysterical at the sight, sound, and feel of the mighty moonrocket. I was, too. More recently, I've begun gathering space memorabilia. My tiny collection includes a relay from the recently recovered Liberty Bell 7, a swatch of beta cloth from Jim Lovell's Apollo 13 couch, and other minor goodies. I've also met a few heroes along the way: Mike Collins (at a charity dinner about a mile from my home), Buzz Aldrin, Jack Schmitt, and Chris Kraft. And the abundance of space-related autobiographies in recent years means I can be found most often with my nose in such books, when it isn't in the ALSJ. Today I am mid-career at a computer company. I won't mention the name, but its initials are IBM. That my office mate's father was in charge of IBM's role in the Saturn's IU is as close as my job has come to space exploration. But more important than anything said here is that I have been happily married to one very understanding person for 24 years ('you paid how much for that minuscule scrap of cloth?') and we have a wonderful, soon-to-be-teen daughter.